Acquired last off-season from Cincinnati, righty hurler Ben Lively quickly joined the ranks of the top Phillies prospects. Originally selected in the fourth round of the 2013 draft, Lively would begin his pro career as a member of the rookie level Billings Mustangs. In 12 starts, he posted a 0-3 record with a 0.73 ERA and an 11.9 K/9 mark. 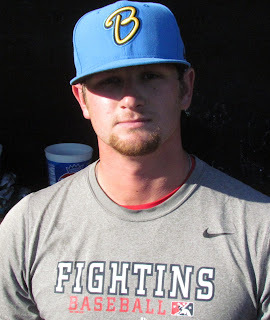 He was promoted to Class A Dayton to close out the season with a single start, allowing one earned run in four innings of work while striking out seven and walking one. This was fresh off his junior season at the University of Central Florida where, in 15 games, he went 7-5 with a 2.04 ERA and an 8.6 K/9 mark as the team's ace. Lively would follow up his exceptional year by becoming the Reds' minor league player of the year in 2014. Opening his first full professional season with Class A Advanced Bakersfield, Lively tallied a 10-1 record with a 2.28 ERA, a .201 batting average against along with a 10.8 K/9 mark in 13 starts. A stretch of 31 consecutive scoreless innings as a member of the Blaze got Lively some considerable attention and he was selected as a California League All-Star. New Years Eve 2014 saw Lively traded to Philadelphia for OF Marlon Byrd. After joining the Phils organization, he was assigned to the Double-A Reading Fightins' rotation last year. The six-foot-four 190-pounder posted an 8-7 record with a 4.13 ERA and a 6.9 K/9 mark in 25 starts there. He missed a couple turns in the rotation in August with a shoulder strain. Taking away two troubling starts just prior to his disabled list stint from his season numbers, his ERA drops to 3.61. The Florida native's repertoire features a low-90's fastball, a quality slider, a change up and a curve ball. The fastball plays better than the velocity can indicate, as batters don't see the ball well when Lively is on his game. All of his offerings come with a deceptive delivery which helps the young hurler. During the season last year, following some poor efforts in games, the 23-year-old worked closely with pitching coach Dave Lundquist on his mechanics, stiffening up his front side to increase power and refine his accuracy. Coaches want to see Lively show an ability to make adjustments on the fly, to address situations with more urgency. Lively projects to remain a starter. He's an unfinished product and will continue to work hard to reach higher levels of the sport. Look for Lively to return to Reading to begin the 2016 season.